In the hierarchy of Christianity’s Seven Deadly Sins, pride is usually considered the most serious of sins and the cause of Lucifer’s fall from grace, as he tried to usurp God’s power. For Michael Mitchell, however, it’s OK to be proud – or at least to stage it. Mitchell, Deferral Coordinator, Enrolment Services, is producing and acting (along with four other McGill staff members) in a dramatic reading of Michael Healey’s Proud, on May 9 atthe Mainline Theatre on St. Laurent. In the hierarchy of Christianity’s Seven Deadly Sins, pride is usually considered the most serious of sins and the cause of Lucifer’s fall from grace, as he tried to usurp God’s power. For Michael Mitchell, however, it’s OK to be proud – or at least to stage it. Mitchell, Deferral Coordinator, Enrolment Services, is producing and acting (along with four other McGill staff members) in a dramatic reading of Michael Healey’s Proud, on May 9 atthe Mainline Theatre on St. Laurent. Healey’s play has been at the centre of some intense drama of the offstage variety in recent months. 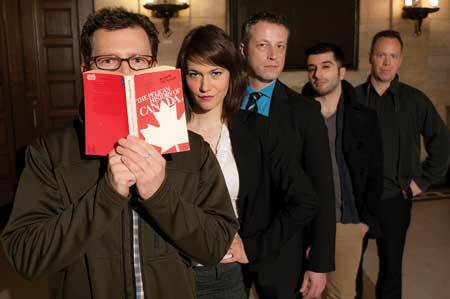 The award-winning playwright wrote a satirical piece whose central character is based on Prime Minister Stephen Harper, though he is unnamed throughout. The problem has been getting the play staged. With whispers swirling of the potential for a libel suit or funding repercussions from the Harper government, theatres have balked at taking on the piece, including Toronto’s Tarragon Theatre where Healey has been the writer in residence for 11 years (until he resigned a few months ago amid the controversy). Mitchell read about the story in the Globe and Mail and knew he had to do something. “The government is taking a bad rap for this because people are anticipating repercussions that might never happen,” he says. “What kind of art do you have if the driving force is fear of retribution that might never come? You can’t make art if you’re afraid to ruffle some feathers and neither can you make art on the premise that you want to secure government funding. “People are asking if the play should even be put on and I find that a strange question to ask. Should Goya have painted The Colossus? If theatres are going to think like that we’ll just be watching television commercials for the rest of our lives,” says Mitchell. Mitchell enlisted the help of four other McGill staffers, Tom Hein (Student Affairs Coordinator, Neurology), Kristina Sandev (Medical Simulation model, Medicine), Frank Babics (Admissions Officer, Enrolment Services) and Shebli Zarghami (Copy Editor, Enrolment Services), and the five have been in rehearsal since early April. When Mitchell contacted the people at Mainline they gladly donated the space for free. This means almost all of the $10 suggested donation at the door will go toward Healey’s self-produced version of Proud next year. Now that he has been working with Proud, Mitchell says the greatest irony is that the Prime Minister character is, in fact, an agreeable one.